The New York Police Department is investigating a recent claim that former New York Gov. Eliot Spitzer threatened to stab a man at a swanky Manhattan restaurant. Former Wall Street executive Jamie Antolini told The New York Post that he was eating with possible business partners at the Avra Madison Estiatorio restaurant when Spitzer overheard him complimenting Home Depot founder Ken Langone. A longtime feud has existed between Langone and Spitzer dating back to when the New York Democrat served as state attorney general. As Spitzer walked by, Antolini reportedly said Langone "should have been president" and was "a great guy." Spitzer did not approve of the sentiment, and according to Antolini and other witnesses, said "I’ll get a f–king knife and stab you right in your f–king c–k!" The c–k-stabbing never occurred, but Antolini filed a police report Friday, and the NYPD confirmed Sunday they were looking into the alleged threat, the Associated Press reported. Spitzer's spokeswoman said Antolini started the argument and that Spitzer originally ignored his comments praising Langone. She denies the former governor issued any threats. 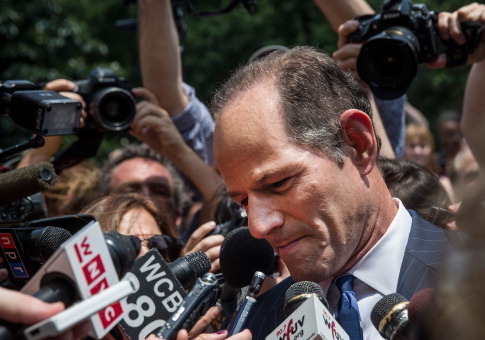 Spitzer was considered a rising Democratic star until he resigned in 2008 after it came to light that he was a frequent client of a New York City-based prostitution ring. After a brief stint as a CNN host and a failed 2013 run for NYC comptroller, he resigned from politics. This entry was posted in Politics and tagged Elliot Spitzer, New York. Bookmark the permalink.